Climate sensitivity is the term used by scientists for the way the climate responds to changes in carbon dioxide levels. As we are in a phase of warming, this is usually presented as how much warmer it will get each time the carbon dioxide [CO2] concentration doubles. On its own carbon dioxide absorbs infrared energy bouncing back off the earth from the sun at a rate that would deliver roughly 1 °C of global temperature rise for each doubling of the concentration of CO2 in the atmosphere. Human activity since the industrial revolution has pushed the concentration to 560 parts per million [ppm], roughly double the 280 ppm before we found coal and started to build factories. So we might expect a warming of 1 °C an amount that should not cause too much alarm. Except that this is not the only thing that happens. As you might expect from a topic so controversial as climate change, there are complexities to climate sensitivity. 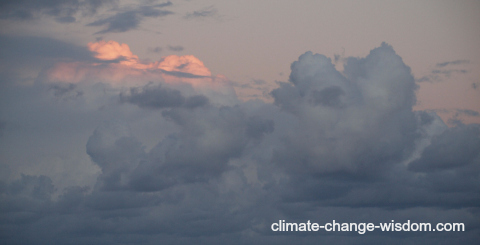 The concentration of CO2 also affects both the amount of water vapour in the atmosphere — this too is an important greenhouse gas — and the amount of cloud. Clouds are especially tricky as they can reflect some of the energy, as when the sun goes behind a cloud it feels cooler. But they can also also trap it. Camping out on a cloudy night will be warmer than nights when you can see the stars. These additional effects on clouds and water vapour means that doubling carbon dioxide concentrations in the atmosphere would produce more than a 1°C rise in temperature. Most of the climate scientists agree with this. They also mostly agree that the addition of soot and fine particles [aerosols] into the atmosphere from burning coal, slash and burn agriculture and all those internal combustion engines tends to complicate matters. As with clouds, some of the sun’s energy bounces off the particles back into space and some of the infrared energy gets bounced back to earth. Unfortunately the scientists cannot seem to agree on the size of the overall combined effect of aerosols. This is typical of many climate change issues. Even when the scientists are experienced and apply sound scientific methods and principles to the problem, the size and complexity of the atmosphere makes understanding the mechanics tricky and predictions uncertain. Yet is it very important to know the overall climate sensitivity. It will tell us if global warming will be mild [less than 2°C], severe [more than 4°C], or somewhere in between. In 2007 the Intergovernmental Panel on Climate Change (IPCC) reported that 3°C of warming would be damaging affecting sea levels, the frequency of cyclones and severe weather, drought, biodiversity loss and uncertain effects on economies. The view of the IPCC is the benchmark scientific opinion — the conventional wisdom — and it will be interesting to see what the next IPCC report due in September 2013 will say about sensitivity. Not all scientists follow the conventional wisdom. Depending on how the sensitivity is calculated some suggest that doubling CO2 emissions will increase temperatures by only 1.2-2.9°C, with the most likely figure being 1.9°C. And a study published in 2012 suggests that there is a 90% chance of the actual change being in the range of 0.5-4.0°C, with a mean of 2.3°C. Another re-analysis of the IPCC material that includes more recent global temperature data has climate sensitivity at 1.0-3.0°C, with a mean of 1.6°C. These versions of sensitivity have warming in the mild range and put into question the conventional emissions reduction policy wisdom — the requirement for emissions reduction else we add too much CO2 into the atmosphere and risk catastrophic warming. Warming above 3°C makes climate change mitigation [emission reduction] a sensible, even a essential, option. Curb emissions as fast as possible to avoid disaster. But if the sensitivity is in the 2°C range or less, then maybe the cost of emission reduction is not so easily justified. It may be a lot cheaper and just as effective to adapt to the climate changes that will come along. So rather than restrict emissions, policies might limit new building on low-lying areas, construct flood barriers, invest in irrigation infrastructure and make landscapes more interconnected. In short, adapt to climate change. The issue of sensitivity of climate to changes in CO2 concentrations is at the heart of the matter. If the climate is sensitive and lead to warming it makes good sense to do something about carbon dioxide emissions. If the climate is robust to a doubling of CO2 concentrations, then we are pushing for something we don’t need to worry about. If we cannot be sure either way, then it would be prudent to curb emissions given that the consequences of significant warming would hurt us — and sooner than we might realise. Climate-change-wisdom favours caution but also would like to see less of the rhetoric and more sound science where weight of evidence reduces risk. Unfortunately the latter is unlikely given that climate change now has a media, bureaucratic and academic life of its own.